Can’t remember where I saw it now, but there was one a while ago advertised with the phrase “deceptively light-filled”. Presumably most of the light is ultra-violet or something. Ahh - that’s fair enough. It’s potentially just as valid as ‘deceptively spacious’. If it looks stolid and gloomy from outside / the front, but it’s bright inside, then I’d have no problem with that. I think it means you think it’s full of light, but on closer examination they’re just antiphotons. 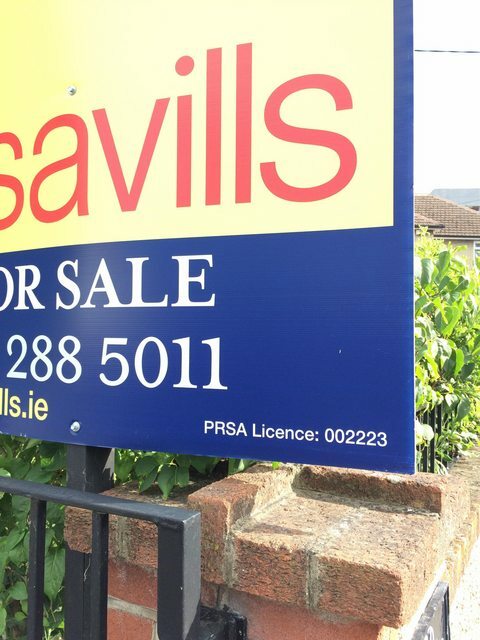 I just noticed that Savills have misspelled “PSRA” on their signs. Generally means that said property is way overpriced and the EA is trying to create a sense of opportunity. Churches cover themselves in glory with this listed at €36,995, or €38/sq ft. This whole ad had me screaming with laughter. Whoever wrote it has been watching way too much Downton Abbey. Very funny indeed, but quite the gaffe all the same. Right so. Would be a good spot for a restaurant. A stepping stone into Ranelagh!.. "Rarely does such a find as this idyllically positioned, architectural gem, that is 6 The Pierre, come available. Janet Carroll is delighted to offer for sale one of the most fabulous apartments on the coast of South County Dublin. Built c. 1830, is the first floor, two bedroom home was the show apartment when the Pierre Hotel was converted in 2007. Designed by award winning architect Niall Brennan, in this magnificent period listed building which has all the features one would expect including high ceilings, excellent natural light and rooms of great proportions. Just a few steps to the seafront, it offers spectacular views of the East Pier and panoramic sea views, including sensational sunsets from Dublin City to Sandycove. Both the town centre, the Peoples Park, the new library and the DART are just a few minutes walk away. The East Pier is virtually on your doorstep. Dun Laoghaire is a very historical location. It began as a small fishing village located on a rocky coast at the beginning of the west Pier, which was renowned for its production of salt. The harbour was built in 1817. The East Pier is one mile long. It cost over one million pounds to build and 600 men were employed to build it. The Pier was one of the greatest engineering projects undertaken in nineteenth-century Ireland. Today Dun Laoghaire is a Mecca for enthusiasts of water sports with centres of excellence in the fields of yachting, sailing and windsurfing. The famous forty foot promontory is close by for all who wish to swim in its deep waters. " Can someone keep this person away from a keyboard? Did The Prophet have an opinion on “watersports”? I don’t remember reading anything specific about it. Seems harmless enough. There is harm in the simplest of things. I think it comes down to whether or not you engage in watersports in the inner harbour or out in the open sea? "If the size of the pool is more than 225 sq ft (20.9 m2) then it is considered a large body of water and will not become impure by non-Muslims swimming in it. If the pool is less then 225 sq ft (20.9 m2), then if the non-Muslim had taken a bath before swimming, the water will be pure since there is no impurity on him. If he did not take a bath before swimming and it is certain that there was impurity on him before he swam, then the pool is impure and all the water must be removed and refilled with clean water." Certainly if you were concerned about seeing another blokes ‘satr’ you be better off avoiding the Forty Foot. I have dealt with that EA. Her business card has a picture of her face on it. 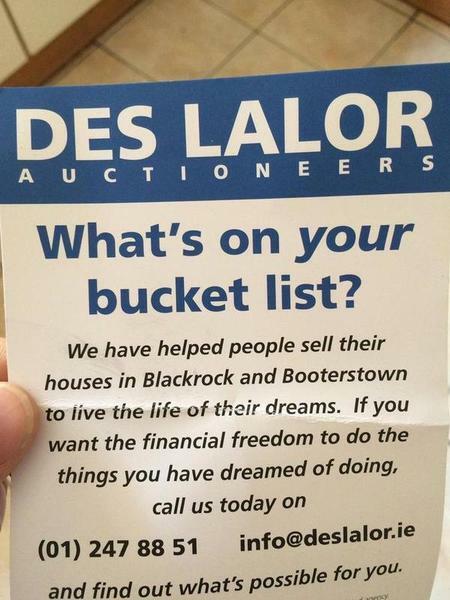 Des Lalor thinks I have a terminal illness. Thanks, Des. The clever design consists of a sitting room, living room and kitchen on the ground floor, and 4 bedrooms on the first floor. Stunningly innovative. Just for those who are keeping track, note that Castleknock has not only crossed the M50, but has carried on and leapt clear over the Royal Canal too. The Shannon is the next natural barrier and possibly our only hope of containing Castleknock before it sweeps majestically to the Atlantic Ocean. I used to just dislike EA’s, not every fibre in my being detests them, they are up there with Ryan Tubridy. Dating from circa 1798, [redacted] Wellington Place is a magnificent Georgian house and boasts the accolade of being the street’s only detached house. In the 20th Century, a barrister named Hewitt Robert Poole and his wife, Elizabeth Mary Poole, resided at the house throughout the 1930s until their respective deaths in 1943 and 1946. Dr Michael Slazenger, heir to the Slazenger sportswear fortune and owner of Enniskerry’s Powerscourt Estate, owned the house for many years thereafter. During his ownership he constructed the three yellow-brick mews houses located to the rear of the main house, fronting onto Wellington Lane. Dating from circa 1798, [redacted] Wellington Place is an extremely attractive Georgian house and boasts the accolade of being the street’s only detached house. In the 20th Century, a barrister named Hewitt Robert Poole and his wife, Elizabeth Mary Poole, resided at the house throughout the 1930s until their respective deaths in 1943 and 1946. Absolutely gas - literally word for word. I don’t mind at all anyway- maybe they’ll drop me a line to write their blurbs from now on? Hunters Estate Agent have great pleasure in bringing 31 Wellington Place to the market. Dating from circa 1798, 31 Wellington Place is a magnificent Georgian house and boasts the accolade of being the street’s only detached house. Dating from circa 1798, 31 Wellington Place is an extremely attractive Georgian house and boasts the accolade of being the street’s only detached house. Dr Michael Slazenger, heir to the Slazenger sportswear fortune and owner of Enniskerry’s Powerscourt Estate, owned the house for many years. During his ownership he constructed the three yellow-brick mews houses located to the rear of the main house, fronting onto Wellington Lane. Eh, a 1% fee on that sales price is €46,500. They have plagiarized your work. Send them an invoice FFS! 1% of that fee is €465. You’d get a weekend away out of that. These posts are very time consuming, so if you wish to quote any of the posts or use any of the information, please link this blog (dublinestates.blogspot.com) as the source. Thank you. an extremely attractive Georgian house and boasts the accolade of being the street’s only detached house. Based on the undoubted plagiarism… just pop them a quick invoice for the copy that they used. Payable within 30 days - you’re not unreasonable.